Understanding Power Factor will help you make an informed decision the next time you buy LEDs. What is an LED Power Factor Rating? The power factor rating is the ratio of real power (Watts) used by the load compared to apparent power (Voltage x Current drawn) into the circuit: Power factor = Watts / (Volts x Amps). The power factor value is calculated by dividing real power and apparent value. Envision a scalene triangle (shown in Figure 1) where no sides are equal and no angles are equal. The bottom of the triangle represents the real power while the hypotenuse of the triangle represents apparent power, and the third line which connects the real power and apparent power is the wasted energy due to poor circuitry. LUX Review gave a great example of the differences between the power factor ratings of two 20-Watt LED flood lights. The first LED flood light has a power factor of 0.95 while the other has a power factor of 0.55. The LED with a power factor of .95 would draw approximately 0.092 Amps while the LED with a power factor of .55 would draw 0.16 Amps. Therefore, if we had an electrical circuit designed for a 6 Amp circuit breaker, 65 LED fixtures with a 0.95 power factor could be installed as opposed to the 37 LED fixtures with a 0.55 power factor. While a majority of residential applications won’t require 65 LED fixtures, unless you take Christmas pretty seriously, this example is to reiterate that low power factor rated LEDs are very inefficient for larger scale commercial applications. Interestingly enough, most electric companies bill by wattage (real power). This means that two LEDs of the same wattage rating, but different power factors, will be billed nearly identically for a residential application. Although, in a commercial setting, depending on a total buildings power factor and utility rate structure, a building owner may have to pay a power factor penalty until the issue is corrected. While having a low power factor may seem harmless, it is largely accounted for at the electrical power plant. By over-consuming more energy than needed it negatively impacts the environment by wasting more energy than needed and in turn results in the emission of excess greenhouse gases. In order to combat this, Energy Star requires LED lamps of greater-than 5-Watts to have a minimum power factor of 0.7. While a power factor of 1.0 would be ideal, in a majority of cases it is not possible. Moral of the story, check the specs and verify the quality of an LED before purchasing. 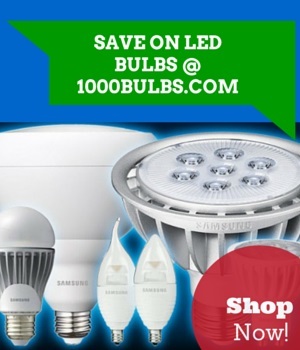 In our efforts to offer energy efficient LED lighting, we here at 1000Bulbs.com strive to provide our customers with a wide selection of high quality Energy Star rated products. If you may have any questions, don’t hesitate to leave us a comment in the section below or reach out to us through our social media pages via, Facebook, Twitter, Google+, LinkedIn, and Pinterest. May 9 Do I Need an LED Driver?